I wanted to create a healthy recipe that's loaded with greens, is high in protein AND healthy. Spinach and pumpkin seeds are also very high in iron. So I came up with this delicious spinach pasta and topped it with roasted butternut squash. Utterly delicious! And you can get all ingredients in your local supermarket too! To make this a balanced meal I added pumpkin seeds to the spinach creme. This brings each portion to around 22g of protein! And if you don't like to add the creme to pasta you can also add it to spinach. This can also be made gluten-free easily. Check out the ingredient list below for gluten-free replacements. The spinach cream with the blended pumpkin seeds is super yummy! You can use either cooked pasta or cooked rice or even quinoa if you would like to make this a gluten-free recipe. All work well with this recipe! It's a perfect combination of the savoury spinach paired with the slight sweetness of the roasted butternut squash. First, cut off the ends of your butternut squash. Then peel it (the skin is quite tough). Using a table spoon remove the seeds and stringy fibres. Then either cut it into bite-sized cubes or slices roughly 1cm thick. Transfer to a bowl and season with a good amount of olive oil, garlic powder or pureed garlic and salt and pepper to taste (I normally use quite a lot of salt as the butternut squash's sweet taste can be overpowering). You can also add the juice of 1/2 lemon for a more tangy taste as well. Mix everything together and then roast in the oven for around 25 minutes. While the butternut squash is roasting, cook 3 portions of pasta (or rice works as well). To make the spinach creme add some olive oil to a pan and then sauté 200g of spinach and 100g of pumpkin seeds. Then add 1 tsp garlic powder and sauté for another minute. Transfer it to a blender together with 3/4 cups of water, 1 1/2 stock cubes (the video only shows 1, but I decided to add another half, as I like it quite well seasoned). Blend well until you get a smooth spinach sauce. Add the sauce to the cooked pasta (or rice) and add the roasted butternut squash cubes on top. Enjoy! 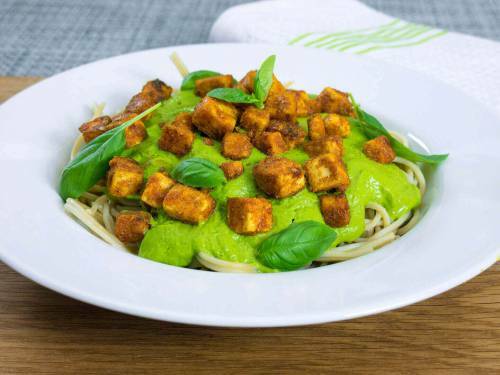 pasta with green avocado basil pesto and crispy tofu.